This the last of four stories published at the end of Dear Life under Finale, four works that are “not quite stories” but, rather, works “autobiographical in feeling, though not, sometimes, entirely so in fact. I believe they are the first and last — and the closest — things I have to say about my own life”. And it is the story for which the collection is named, even though the other twelve works are presented as quite-stories, rather than not-quite stories. As with “The Eye”, “Night”, and “Voices”, “Dear Life” draws attention to the intersection between feeling and fact as well, perhaps even more overtly than in the other three works. Only Life. As though it is inherently inferior. Whereas, in fact, Roly Grain would have made a delightful name for a character in a story, his existence allowed to swell beyond a single sentence. But a novelist must make choices. She considers this in “Voices” as well, in discussing the different way in which she would have portrayed Mrs. Hutchison had she been a character, rather than not-quite-story Mrs. Hutchison. But her elaborate dress is a vivid memory and it appears in “Voices”, even though it would not have been afforded an existence in the fictionalized version of those events. Are readers to think, then, that real life is the dear thing? That in fiction things cannot shine as they truly do? Another story, too, in Who Do You Think You Are? also echoes the not-quite-story in “Dear Life”, for here the mother’s illness is not understood to be as serious as it was. In “Half a Grapefruit” Rose’s father’s illness was not understood to be as serious as it was either. That story begins with Rose’s preoccupation with the different food that the schoolchildren consume for breakfast (which reveal the tensions between ‘town’ and ‘country’ and the place between that are at the heart of “Voices” in Dear Life as well), and continues with the importance placed on various other stories told, including the one that Flo tells Billy Pope when he comes to take Rose’s father to the Veteran’s Hospital, about her having thought she’d been poisoned by a neighbourhood “witch” who had actually fed her a piece of mouldy cake some years ago. These are the stories told, among others, but the story that remains untold is the one about Rose’s father dying in the hospital. Throughout the collections of stories, there are daughters who do not return, daughters who return for visits but were not present for deaths any more than Rose was for her father’s, and daughters who do return and resume care-taking duties. This is said of the not-quite-story mother in “Dear Life” but it seems true, too, of the not-quite-story daughter as well. And the overlap between the discussion of fact/fiction in the introduction to The Moons of Jupiter is not all that different from the introduction made to the final four works in Dear Life; this statement made about the fictional mother is about how she sounds, but the not-quite-story mother stands out in the same way, though it’s said to be because of how she looks. The boundary between town and country is as likely to shift as the boundary between feeling and fact, and in many ways it doesn’t matter whether a home is near the banks of the Saugeen River or the Wawanash River, or the Maitland River. What one chooses to include in feeling and in fact varies and alters; a writer chooses her words, and Alice Munro has chosen hers deliberately. And, in the end, what we say is as likely untrue as it is true. What can happen, what can never happen, what happens all the time: shifting states of reality, with permeable boundaries, on and off the page. 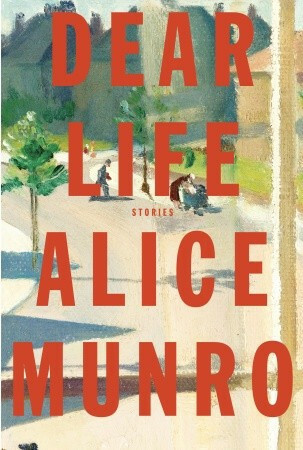 Note: This is part of a series of posts on Alice Munro’s stories, as I read through her work-to-date. She is one of my MRE authors and, until now, this has been a chronological reading project, but I was unable to resist inserting her most recent collection though this work is the final in Dear Life. The other stories in the collection are considered here: To Reach Japan; Amundsen; Leaving Maverley; Gravel; Haven; Pride; Corrie; Train; In Sight of the Lake; Dolly; The Eye; Night; and Voices. Please feel free to check the schedule and join in, for the series, or for a single story, when discussion of Friend of My Youth begins May 1.